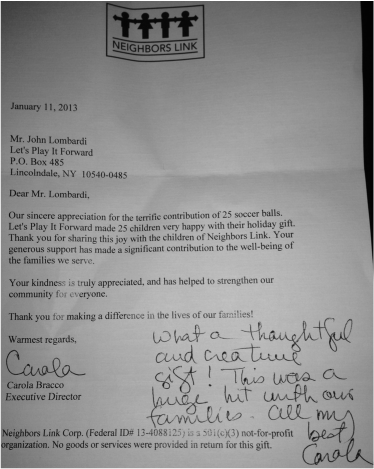 I express my deepest gratitude on behalf of Caribe Baseball Little League Inc., for the generosity and beautiful gesture of you and the Lets Play It Forward Organization for the donations received from sports supplies that will benefit many children of our league and athletes in general in the Dominican Republic, lacking resources and I swear it is a great incentive to continue working for the good of social causes. You can be confident that your help will be delivered to the people who really need it. On behalf of all our members, we thank you from the heart for such valuable donations that you have made to us, and that you will undoubtedly enjoy. Fredrick Lawson has received the package and I want to say a very big thank you. 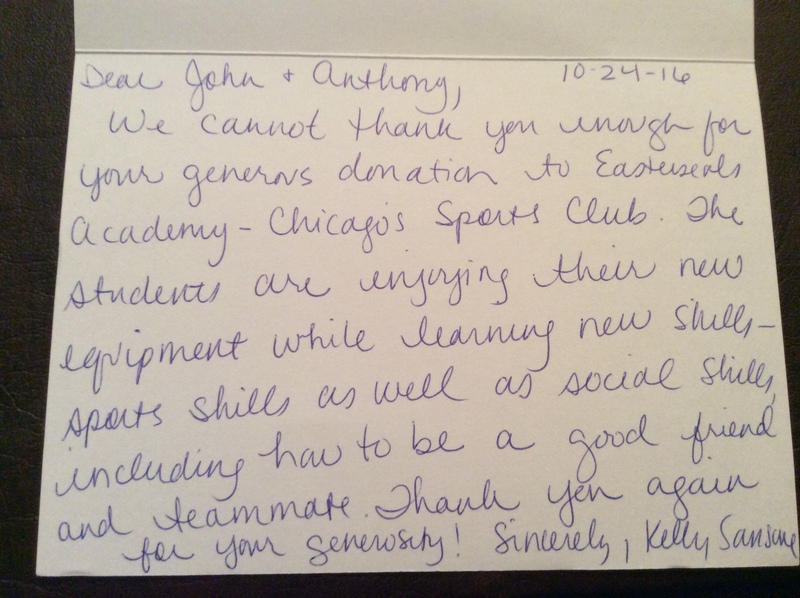 This means a lot to our organization and we hope to grow with you in helping influence society through sports. 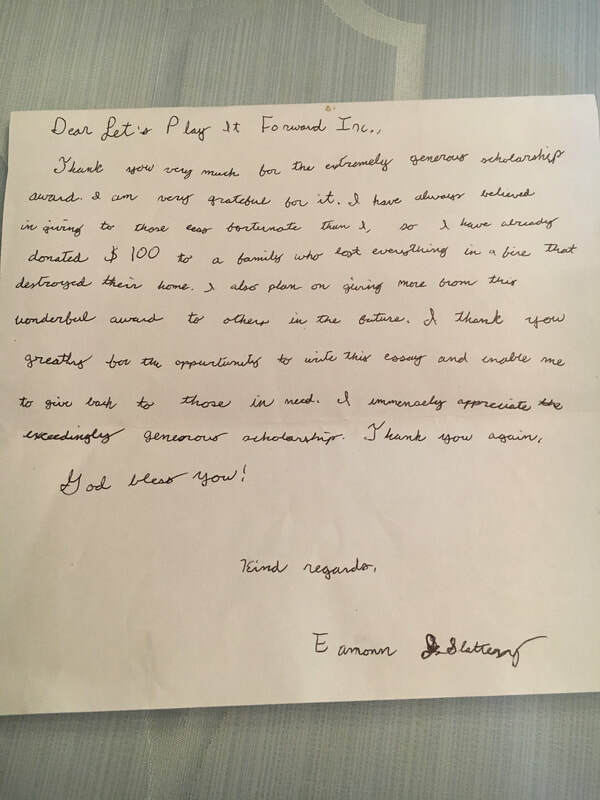 I am writing in regards to the tennis rackets, soccer balls, dodge balls, basketballs, baseballs, and footballs donated by Play it Forward. Please accept our sincere thank you for the amazing sports equipment. Our students are sincerely grateful for your generous donation. We would also like to thank Luis Velez for delivering the equipment. Our Tax Certificate number is EX-690210637. Thank you again for your donation. I hope this mail finds you well. I would like to take this opportunity to thank you so much for your support of cleats that has made our team perform very well this season. As we move to the next season I wish to tender my formal request for your help once more. Hope to hear from you at your convenient time. As I said, whenever we run a Good News for Young Athletes workshop, we will collect for LPIF. If it's possible for you to add a link to our website, www.hiddenrocksports.com, as well as the photocaption from our event, to your website, that would be wonderful! Thanks so much. Good luck with the last weeks of school and your college search. I'm sure we'll be in touch. On behalf of Marcus Rodgers, Sports Fitness Director of the Madison Square Boys & Girls Club, I would like to thank Play It Forward Organization for your contribution of numerous of product that have a large significant monetary value. We appreciate everything you donated so far such as, 20 pairs of Rollerblades, three pairs of ice skates, 15 tennis rackets, 30 baseball bats, 40 basketballs, 30 pairs of cliques, hundreds of baseballs, and baseball jerseys. You support helps our mission by enhancing the kids’ lives providing product that are much in need for our sports program in our community. Antonio Velez and Play it Forward Organization generous support makes it possible for our mission to come to fruition and make our community a long term great partnership. The balls have officially arrived. We are so happy and mostly greatful for the hardwork and dedication that you guys have. I will send pictures of the kids with the balls over the weekend since we resume training then. Thank you so much again and may the almighty bless you all as we continue to work together. My name is Michael Oyedele and I am the girls' soccer coach at Frederic Douglass Academy in Harlem. I got your e-mail from Massimo Garguilo. Massimo has given me the soccer equipment you sent and I want to say a big thank you for your generosity. God bless you! The girls and I are all very grateful for all your help. Hi! I wanted to send you a quick "thank you!" for all the donations you have made to Kizito's Kidz! They have arrived safely in Kenya and as you can see there are a lot of happy kids. You have given us this great opportunity to make a difference in their lives. Thank you. I would like to thank Mr. Antonio Velez and Lets Play It Forward Organization for donating a large donation of sports gear, such as, football practice jerseys, basketball jerseys, and T-shirts to the Madison Square Boys & Girls Club Columbus Clubhouse . We received 40 different jerseys for basketball and football and 10 shorts. Our members deeply appreciate your donation. We were in need of these products for our upcoming middle basketball league and for our flag football games to practice and it definitely helped in a huge way. Thank you so much for passing the torch to make our younger generation much more productive and have a great experience playing flag football. I hope you all have been well. I apologize for the delay in providing you with pictures from my church group's trip this summer. However, here are some pictures that my church members took this summer while being abroad. You can choose which pictures you would like to use and upload. Thank you for all that you do. My church was so blessed through LPIF's commitment to making their mission a reality. And most importantly, the students and leaders abroad were amazed at your contribution and were overjoyed at your generous donation. I hope and pray that LPIF will continue to reach all parts of the world, and my church and I are so happy to be a part of your mission. And to show our gratitude, the members from the past short term missions and I will be donating to your organization hoping that this small amount might help with your organization's mission. Thank you once again so much for your donations and your time. Hello, once again sorry for the delay in response. Having issues with connection over here. Yes I received the footballs and thank you for the airpump and the bag as well. It is very much appreciated and they will be used to the fullest. Thank you! John, my name is George Metz, I am athletic director for the CYO program at St. Mary's in Fishkill. We are a program with 350-400 kids from the 2nd grade through high school....we have 8 travel teams for boys and girls and 25-30 in house teams. I was contacted by the CYFM and their leader Zbynek Gold about uniforms which you had donated to their organization. He was looking for someone who would need them and use them. They were blue, boys and girls uniforms that had come from St. Mary's community school in Crown Point, Indiana. These uniforms will be a tremendous help to our program. We are obviously a St. Mary's program, so the name on the uniform is perfect, and our parish color is also blue. Our program supports itself, we get no subsidy from our parish, so all our money is generated from registration $$ and fundraising. This year one of our needs, was to purchase new travel uniforms, which would put pressure on our fee for registration. Receiving these uniforms will help up maintain an affordable registration fee for all who play in our program ($65-$85). So Zbynek's call was truly a God send. I wanted to make you aware that they are being put to good use and thank you for the donation to the CYFM. I also told Zbknek we will make a donation to the CYFM since we are now avoiding the uniform replacement cost we would typically incur. im so sorry for just now getting back to you. i haven't had service until now. i got the bats and they are great. he loves them and actually cried when he got them. he says thank you so much. i didn't expect to get such nice ones and they are perfect. he got his first hit with one and says they are his "lucky dinger sticks"!!! again thank you so much and please let me know if there is any way to repay y'all! Thank you so much again for your very generous donation to our newly formed Athletics Program. I’ve already posted about it on my personal social media pages, and shared the items (as well as pictures I took of them) with our PR team and some of the higher ups, and everyone is very excited about getting everything up and running). So you have it for your records and reference, please see the attached donation receipt form, which puts a monetary value on the items donated our way from Let’s Play it Forward. Thank you again and we look forward to a solid relationship! fours(4) boxes of equipment. May God in heaven continue to enrich you. I pray as you bless these kids God will surely bless you guys too. Thanks so much! We all LOVE YOU Evang. Peter Imonikhe John. I sincerely want to thank you for making the trip down today. This donation will mean the world to our students. Our school doors are open for your organization and I can't wait until you get the chance to meet our kids. They will be so thrilled to see all the new equipment. 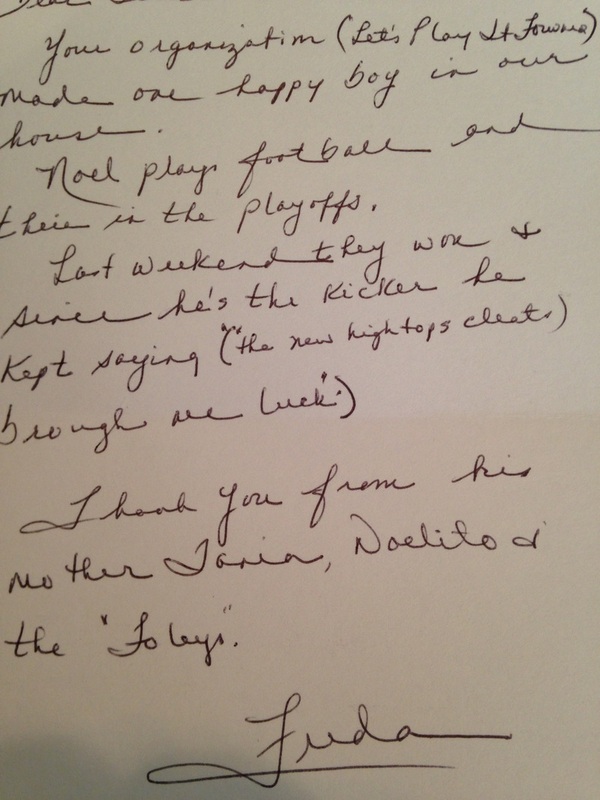 I appreciate your time and energy and send my regards to Grandpa Gus. Take care and safe travels back home. How generous you were to donate the gift basket, football and $50 gift card to Amazon for the Somers Women’s Club Tag Sale and Raffle. The winner was thrilled because her grandson is a young football player! On behalf of the Somers Women’s Club, thank you for supporting our organization and the work we do. You are greatly appreciated! Just a note to thank you for your assistance with the Opalene Wilson Memorial Scholarship. I thought you would like to share with the family and the committee that the young man who won the scholarship gave the money to a needy student to use for tuition next year. We are very proud of him and grateful to you. Our kids might never be able to physically repay your kindness but I want you ti know that every day one of our children picks up a ball or shoots a hoop or trades a basketball mitten - it's all because of your generosity. Who knows who our kids will become because of YOU! 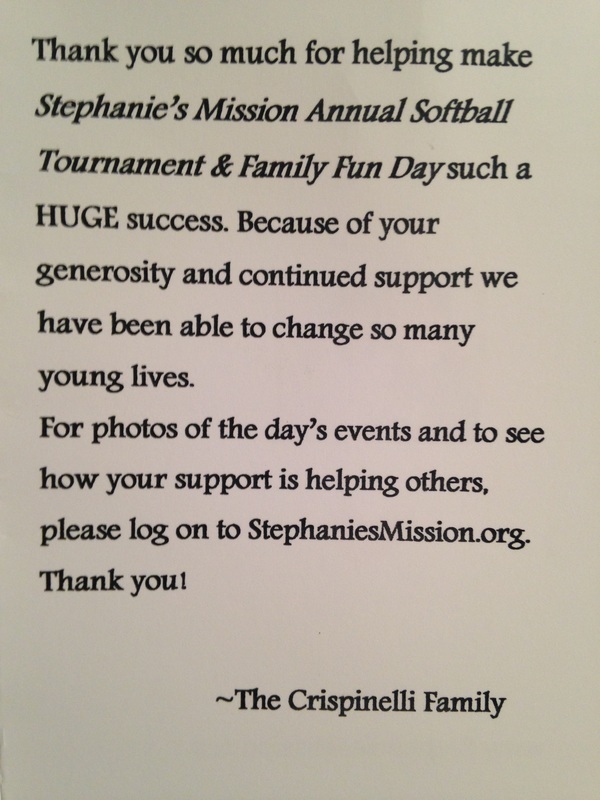 Again, thank your for putting Ms. Hashmall in touch with St. Christopher's Inc. - your efforts continually make a positive impact in the lives of our children every day. On behalf of our CEO, Board and children and families at St. Christopher's, thank you so much for your friendship and support! On behalf of the Children's Home of Poughkeepsie, thank you all so very much for donating so many great pieces of used sports equipment. With 70+ kids in our care, you can imagine how many different sports our kids are interested in and how much equipment we go through! Your donation sure put smiles on a lot of faces. We are grateful for your support and thoughtfulness toward our children. The Children's Home provides a range of services and programs giving hope and healing to abused and neglected children in the Hudson River Region. Last year, we served 269 children and their family members. We provide a full range of residential services including campus-based care, community-based group homes and boarding homes and independent living apartments, as well as regular foster care and intensive therapeutic foster homes in the community. 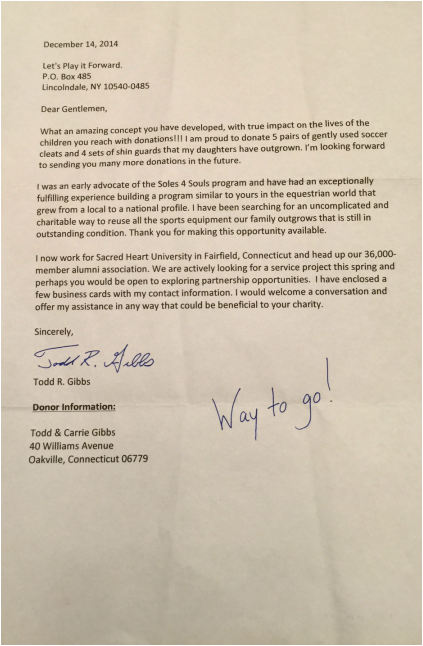 AS you can imagine, the outpouring of support from the community is critical to our success. In short, we could not fulfill our mission without the help of friends such as you. Spring is in the air at the Children's Home. The children are gearing up for their Kids Who Care Talent Show. Proceeds raised from the Talent Show allow the children to give back to the community, by supporting organizations like the SPCA, Camp Sundown and visiting nursing homes and senior centers. Thank you again for thinking of our children. Congratulations on being honored by ABC News for all of your hard work and dedication. Wishing you all a happy and healthy spring! I just want you all to know that I met your Teresa and she told me how old you guys are and I want to say that i'm so proud. She has done a great job with you all and what you all do is something so amazing and you all should be blessed to do something like this at your ages. I wish that I knew people or parents that had the heart and will that you guys have. A lot of kids would be happier and I want you all to know that i'm 38 years old and I cried today when I saw all the stuff. When I was overwhelmed with joy for the kids, I wanted to tell you, thank you from the bottom of my heart because it's not most people that would do this for others and may god pay it forward to you with health, love, and life. You guys have an amazing heart and will always be blessed in your lives. I'm making a Facebook page soon and I will put up all of the pictures. They're for you to see but from a father I want to say god bless you and thank you all so much for your donations to neighborhood kids that will be so happy when they see it. On behalf of the Somers Women's Club I would like to thank you for your generous contribution to our annual SomersnWomen's Club Tag Sale and Raffle. We were delighted and surprised to receive your contribution. It was won by the husband of our members, who will surely be shopping at Foot Locker!! We also want to acknowledge with gratitude your willingness to also donate gift certificate to a needy student in Somers schools. A new and desperately needy student was made known to the school social worker just the day before we brought them your donation. She was overwhelmed and overjoyed. Your support enables us to contribute to worthy local causes, and has made the start of school much easier for one child. Helping to meet need where we see it is philanthropy and community spirit at its best. Thank you very much for your generous support of PowerPlay NYC. Your donation of soccer, basketball, tennis, volleyball, and lacrosse equipment will help us provide one-of-a-kind sports and life skills programming for girls in underserved communities throughout New York City. This athletic equipment will be vital in helping our coaches engage our participants in sports and healthy lifestyles. PowerPlay is all about making girls stronger and your gift offers resources that transform lves and help girls dream big and achieve their goals. Your donation supports quality programming provided free of charge to girls throughout NYC's five boroughs. During the 2012-2013 school year, we provided weekly after school programming through our STARS Series program model at a record 29 program sites, reaching over 650 girls throughout NYC. This summer, PowerPlay offered our 11th annual SuperSTARS Summer Leadership Academy for High School Girls. Thank you for joining our team. Together, we'll change lives, one girl at a time. For your information, PowerPlay NYC, Inc. is a 501c 3 not-for-profit corporation. Our Federal ID number is 13-4045021. To satisfy IRS regulations, it is duly noted that no goods or services were provided in exchange for this contribution. Thank you for the contributing five small bikes and several soccer balls to Boys & Girls Club of Northern Westchester. Each of us can play a vital role in helping young people overcome the obstacles that they are exposed to daily and achieve their dreams no matter what their circumstance. It is our belief that every child has the potential to BE GREAT. Your generosity helps to ensure that our members have fun as they learn, positioning them to mature into productive adults. This gift will be recognized as Let's Play it Forward. If you wish it to be recognized differently, please advise us. Again, thank you for considering the needs of our kids. Dear John, Anthony, and Ms. Lombardi… on behalf on behalf of the Renaissance organization we would like to say thank you for your gracious donation of equipment. It is so empowering to see youth taking initiative and getting back in such a great way. Keep up the good work and I look forward to staying in touch with you. On behalf of Hero, INC., I want to express our deep appreciation for your donation of tennis racquets to our organization. They will be used by our staff for programming and also will be given out as "prizes" at our next tennis carnival. For the past several years HERO has been working with the James E. Allen Junior, Senior high school, in Dix Hills, New York. We serve over 300 adolescents who are multiply disabled using warm-ups, games and skill development-in this case the volley. They then use their newly acquired skill to win prizes. They love the experience and having your donated racquets will make it all the more special! Given what HERO does-providing adapted tennis to 1,400 adults and children with disabilities, each year, we are particularly excited about your mission. The need is great and your organization will make a very positive difference in the lives of so many deserving people. 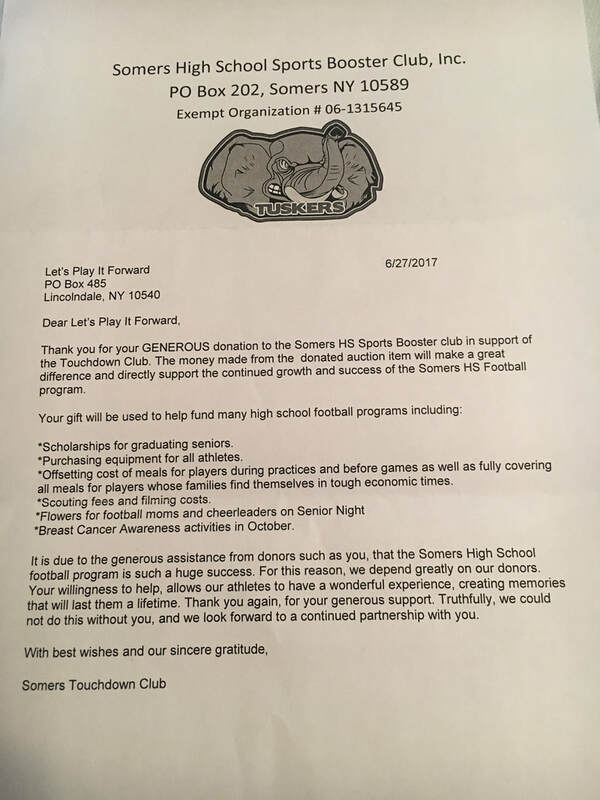 I just wanted to send a quick email thanking you for donating to the Somers High School National Honor Society Midnight Run. The Run was a HUGE success. At first my fellow captain and I were worried we weren't going to have enough donations to take down with us but we ended up filling an entire school bus that some of the 25 students had to triple up available seats. Since it was very cold that night, we didn't see as many people as usually at the six stops we made. Everything left over from the run wen to a homeless shelter where it was guaranteed to be used. The Run was so successful in giving high school students such an amazing volunteer opportunity and helping the less fortunate. It wouldn't have been possible with out your help so I again thank you so much for your donations and generous support for this organization. Thank you for the gift card and the two hockey bags for the New Rochelle Special Olympics. Some might say that your act of kindness might be small but in reality it is MUCH-MUCH more. You are a young man who acts much older than your years. I appreciate your not only providing the equipment but helping me get the two large bags into my vehicle. Your kind and polite demeanor around adults is something that did not go unnoticed. I know you will be successful in whatever you decide to do in life. Please, know there will be many smiling faces in New Rochelle because of you. I attached a schedule for this years season. Please know we would love for you to attend. On behalf of the African Volunteer Football Academy for the less Privileged (AVFAL), I would like to thank you for your generous donation of soccer equipment to AVFAL. Your contribution makes it possible for us to effectively carryout our objectives. Although we did accepted your donation in 2013, we had some difficulties shipping them but as you can see from the pictures below, these equipment are currently been used by the kid's in Limbe. Since its inception on November 14, 2005, AVFAL has been active in our community. With these donations, we would be able to effectively take part in all youth soccer competitions around Limbe and Cameroon. This is only possible because of thoughtful contributions from people like you. In the coming year, we planning of expanding our program and we are hoping for your continuous support. Our next shipping to Cameroon is planned for November 2014 as we are looking for means to keep the program running yearly with the continuous provision of soccer equipment, so please keep us in mind as you collect used soccer equipment for children in Africa. Thank you again for your donation of gloves. Because of you, kids everywhere will get to play ball too. As you know, gloves are key to playing the game and they are our single most requested item. Through our new Track Your Glove program, we are now able to tell you exactly where your donation is making a difference. We are now able to share with you when your glove leaves our warehouse and arrives at the next destination. I’m happy to share that your glove went to help children play baseball in the Bronx. The more gloves we receive, the more children we can help. Please share with your friends on Facebook (www.facebook.com/pitchinforbaseball) and Twitter (www.twitter.com/pitchinbaseball) and tell everyone how you are making a difference! I would like to take this opportunity to thank you for your recent donation to Roberto's kids, as well as your support of our organization. The goal of Roberto's Kids is to collect and distribute equipment from baseball leagues, charitable organization, individuals and retailers in the United States and Canada and provide that equipment to disadvantaged youth in countries where baseball is loved and played with passion. Several collection hubs throughout the United States and Canada are actively collecting baseball equipment to be distributed in the Dominican Republic, Nicaragua, Nigeria, Uganda, Venezuela, Mexico, and Puerto Rico, as well as the US and other countries throughout the world. Your donation will be part of the next shipment of collected equipment that ravels to these countries. It is a privilege to partner with impassioned individuals like you who help to enrich the lives of those much less fortunate than ourselves. You have truly made a difference by touching and inspiring so many lives. On behalf of the African Volunteer Football Academy for the less Privileged (AVFAL), I would like to thank you for your generous donation of soccer equipment to AVFAL. Your contribution makes it possible for us to effectively carryout our objectives. Although we did accepted your donation in 2013, we had some difficulties shipping them but as you can see from the pictures below, these equipment were packed into 9 barrels and are been shipped to Limbe, Cameroon. I will be traveling to Cameroon on May 10, and upon my return to the US, I will provide you with pictures of how the equipment were distributed and used by children in my community. On behalf of Pitch In For Baseball, I'd like to thank you for your recent contribution of equipment. PIFB is a registered 501(c)(3) organization (EIN #86-1141299). Your support helps to give the gift of baseball to children around the world who otherwise would not have the opportunity to play. Over the past eight years, we have helped more than 200,000 kids play baseball and softball in more than 75 countries internationally and nearly every state in the U.S. This past spring, we gave more than $200,000 worth of equipment to 23 baseball and softball programs in New York and New Jersey affected by Hurricane Sandy, resulting in some 9,500 kids being on the field who otherwise would not have been. Internationally, we helped start programs in five schools at the Associaçåo Brasileira de Baseball e Softball Escolar in Brazil, giving 250 kids the chance to play baseball for the first time. In Uganda, we are a significant piece in the continued efforts to grow the game and support their Little League World Series ambitions. Assisted assisting 35 baseball and softball teams in 28 schools deeply affected by budget cuts in the Philadelphia School District. People like you all make this possible. Thank you, again, for helping us bring the joy of baseball to so many children. Thank you for your generous donation of baseball equipment to support children in need. It arrived at an opportune time, as tornado-ravaged Moore, Oklahoma has already received equipment from us, and we anticipate additional shipments in the coming weeks and months. Our organization continues to make an enormous impact on children both here in the U.S and around the world thanks to the ongoing generosity of people like you. We are glad to have you and LPIF on our team. Thanks John! The box arrived. Looks great. I really appreciate the donations! You guys are helping to make our soccer camp a success. I'll try to send you some pics after the camp in July/August. I checked out your website - was really encouraged to see you young guys rockin the cause. Keep it up. I wish more youth would do likewise. The First Tee New York, Inc. would like to thank you for the generous donation to our program. Since, The First Tee of New York began operation of Mosholu Golf Course and Driving Range we have developed a Junior Learning Center to provide underprivileged youth with access to golf training and Life Skills instruction. We will use the items you donated to help in teach these youngsters our great game. The First Tee of Metropolitan New York is a 501-(C)-3 (Federal Tax Number: 31-1724122) charitable organization and in accordance with Federal Income Tax Law, we must notify you that since you received no goods or services, the full amount of your donation is deductible. Your donation helps make all this and our dream of growing the game and promoting golf's special values possible. The First Tee of New York, Inc. The uniforms were delivered this morning and they exceed my every expectation! Well, are they gorgeous. I immediately took them over to the campus next-door to show them to the kids and the coaches. They were thrilled. One 8th grade girl burst into a fit of laughter. I asked her what was so funny and she said, Mr. Wilson, "This is so amazing! I can't wait for our first game on Friday." Thank you, and everyone at Let's Play it Forward for the tremendous work and dedication to our inner-city students. Only through the work of your organization are my boys able to participate in an organized basketball league this season! Thanks for everything! 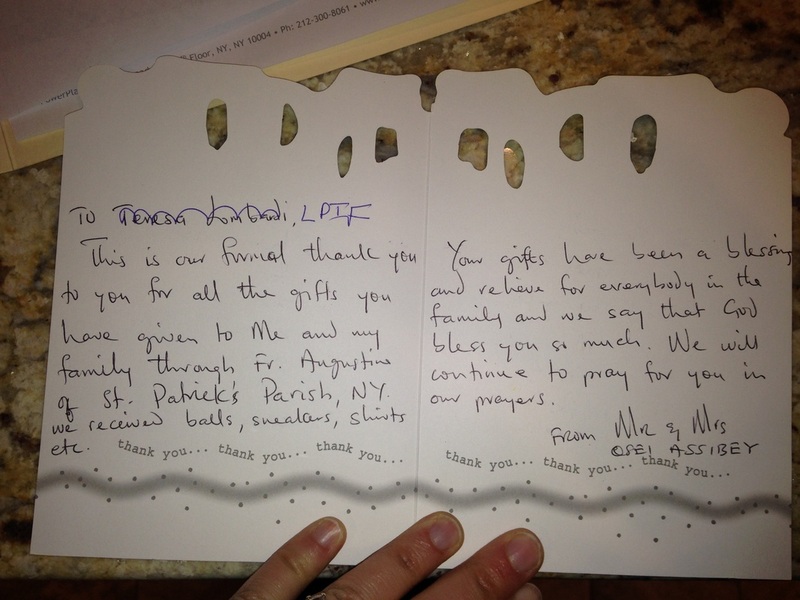 Good day enclosed is a check from our dress down day at the Neponset Campus of Pope John Paul II Catholic Academy! It is an honor to support your work in the name of your grandmother and your Uncle Russ. We are very sorry for your loss and from what your uncle says your grandmother was a tremendously loving in faith filled woman. So to give a donation in her name for wonderful work is a treat. Your Uncle Russ is a vital part of our schools. He is more than a leader and a friend to all. When I asked my faculty if they would like to use our dress down day for this cause, they immediately said YES! They felt awful for the loss of your grandmother and this helps them reach out to your family. Your Uncle has been a constant support for many teachers and students it is not uncommon for him to call a teacher or visit a student who is having a bad day. My students were also thrilled to support this cause. My student, Paul gave up his plan of raising money for cancer for the scholarship. We are very lucky to have him as a regional director and more importantly a friend. As your Uncle Ross would tell you, many of our students would be the recipients of your donations if they lived near you. So it was a joy to watch them bring in their money as if they were rich and buy new equipment for others. They felt empowered to make a difference. My faculty students and families love your Uncle and and they were thrilled to do this for him. Ryan your Uncle is so proud of you and your friends. He speaks so highly of all his nieces and nephews! As I read your website I smiled and knew you were a chip off the old block. You and your friends are changing lives in changing the world. Gods ask us to use our gifts and talents each day. How proud God is of you! More importantly how proud your grandmother is. Thank you for doing this work. 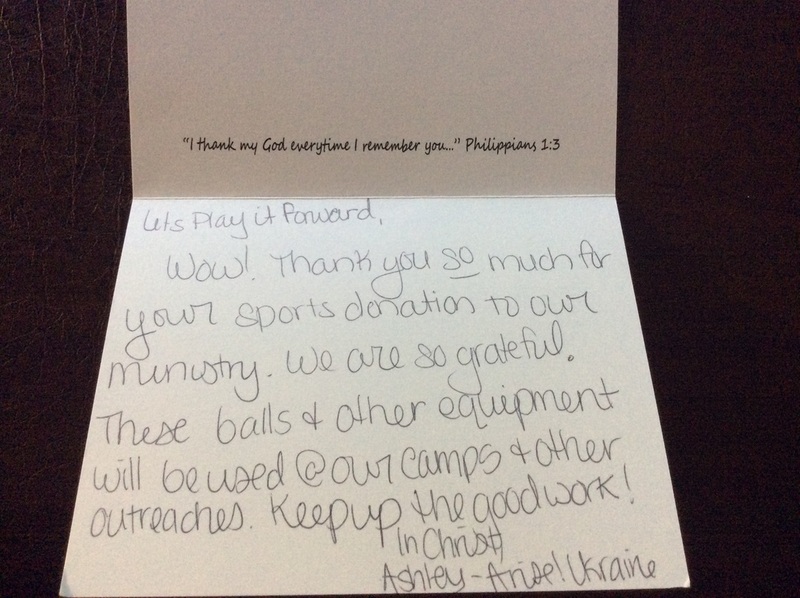 There are many children like my students who will be so happy with a soccer ball or cleats continue to do Gods work. Please use this money and anyway that is needed! As I write this note I am completely overwhelmed by your generosity and kindness. Thank you for thinking of our kids in such a BIG way! It means the world to us. I am looking (And so are the kids) forward to meeting you in person at the pancake breakfast. PS. Your boys are truly angels sent from above! On behalf of the Board, Staff and our young members of the club. I extend our thanks to you snd the teens of Let's Play it Forward for contributing balls, mitts, and guards that were collected from their sports equipment drive to Boys & Girls Club of Northern Westchester. Your generosity helps to ensure that our members have fun as they learn, positioning them to mature into productive adults. What a joy it is for me to read in the The Daily North Salem that your magnificent idea to collect outgrown sports equipment and donate them to needy children has taken off. I am deeply touched by your generosity and spirit of sharing to bring the joy, strength, cooperation and discipline of playing together to other children through the medium of sports. What is more, your willingness to reach out beyond New York to Ghana. May God bless you for your love and care. And may your efforts and all who volunteer to help you, and all who donate items be abundantly rewarded by the Lord. Be assured of my prayers for the success of this mission and if there is anything I can assist with, please let just me know.With every good wish and respectful regards to you and your families. On behalf of Homes for the Homeless Summer Camps, and the hundreds of children we serve each summer through the program, I would like to thank you for your recent donation. The various sports equipment you provided will be great use throughout the 2012 summer camp season. Each July and August Homes for the Homeless Summer Camps Lanowa and Wadonda serve hundreds of children from New York City's homeless shelter and foster care system. Located 45-minutes from the city in Harriman State Park, Camps Lanowa and Wakonda are a new environment for the children, where they have the opportunity to truly experience the great outdoors. During their 16-day stay our campers, ages 7-13 swim, canoe, and fish on the lake, go on nature walks and enjoy evening campfires. They develop friendships with their cabin mates during their daily visits to the music, drama, learning centers, and bond with their counselors who guide them through their stay. Thank you again for your donation, and all the best for a wonderful summer! Thank you to all who have donated equipment. The 2,191 pieces of equipment collected to date has been distributed to St.
Christopher's Inc., Boys and Girls Club of Mt. Kisco, Homes for the Homeless in NYC, Pitch in for Baseball, Miracle League of Westchester, Katonah Community Center in Mt. Kisco, Boys and Girls Club of Mt. Vernon, NY, West Side Soccer League in Harlem, NY. and P.S. 50 Talfourd Lawn Elementary School in Jamaica NY. Also, as we are looking to expand the reach of our organization, so if you know anybody in the area that would like to donate some used equipment, please let them know about our organization. If you know of an organization you would like us to donate to please contact us. Once again thank you for your support.